The Bulldogs turned the ball over but Saints' star Shelby Miller missed a go ahead basket with six seconds left and Truman's last ditch effort by Rachel Steinhoff was short sending the game into overtime. In the extra period, Rita Flynn gave the Saints the lead to make it 10 straight points but that is when Tomczak took over. She tied the game at 68 then converted on a three-point play with 2:43 to play. Flynn's jumper knocked it back down to one point but Tomczak and Allie Norton got back-to-back hoops to give Truman a five-point lead with a minute left. After a made basket by Ali Ringering to cut the lead down to three with 29 seconds to play, the Saints called a timeout they didn't have resulting in a technical foul in favor of the Bulldogs. Norton missed both free throws but Steinhoff made it a four-point lead after being fouled on the inbounds. 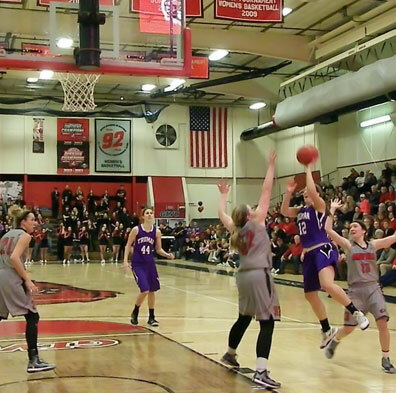 Sam Andrews grabbed a key rebound on the defensive end and converted on her free throw attempts to seal the victory. 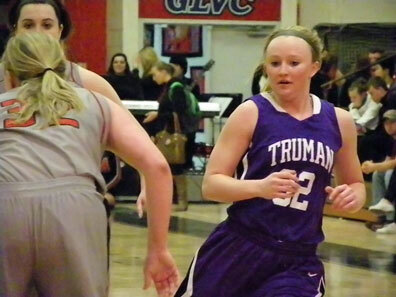 Truman is in a tie with Missouri-St. Louis for fifth place in the GLVC at 9-7 and the two teams will square off in Pershing Arena on Saturday afternoon. The Tritons defeated Quincy in overtime at home. Four players finished in double figures for the Bulldogs behind Tomczak's 17 and Strait's 16 to go with 10 rebounds. Norton finished with 12 and Ashley Hartwig ended the game with 11. The Bulldogs shot 38% from the field and won the glass 43-37. Alex Wolf led Maryville with 18 points with Flynn scoring 14 and Miller adding 12 in her home finale. The Saints turned it over 21 times and shot 48% from the floor but just three of 11 from long range.